Mrs Prada loves to assess the state of the world with veiled cynicism and mighty wit. The Italian designer can always be counted on for a gripping dissection of social and cultural affairs with her acute awareness of political landscapes; whether she’s questioning the stereotypes of masculinity and femininity, posing larger questions about the migrant crisis in the Mediterranean or exploring her own Communist past, there is always something larger at play than clothes in her collections. Us, the audience, revel in this dramatisation and critique of the world—she’s in one of the few designers who can perfect the balance between creativity and commercialism, and generally puts other designers on the sparse Milan schedule to shame after she presents. Her Spring 2018 show commented on the duality between real and virtual worlds and how as humans we exist in both. She contrasted her set (designed by frequent Prada collaborator James Jean and Belgian artist Ollie Schrauwen, in conjunction with architectural practitioners AMO), an expansive floor-to-ceiling comic book strip with the clothes which concerned themselves with practicality and fetishised—in classically Prada fashion—the mundane. It is imperative to examine the duality between the comic book and mundanity. Comic books are typically low-skill works and mundanity is characterised by its relationship to the humdrum of the quotidian. Secondly, comic books have become so commonplace what with the explosion of Marvel and DC cinematic universes. The films deriving from these cinematic universes notably offer a vague observation on ‘good versus evil’ in the present day. Ultimately, they are alternate worlds. Crucial to Mrs Prada’s work is the way she heightens normality—she has been a purveyor of this notion in fashion long before the arrival of the pastiche work of Demna Gvasalia, Gosha Rubchinskiy and Lotta Volkova. She contrasted the devilish playfulness of the artfully-emblazoned shirts, girlish rompers and boyishly-hued boiler suits with sober workwear, trench coats and fine knitwear. 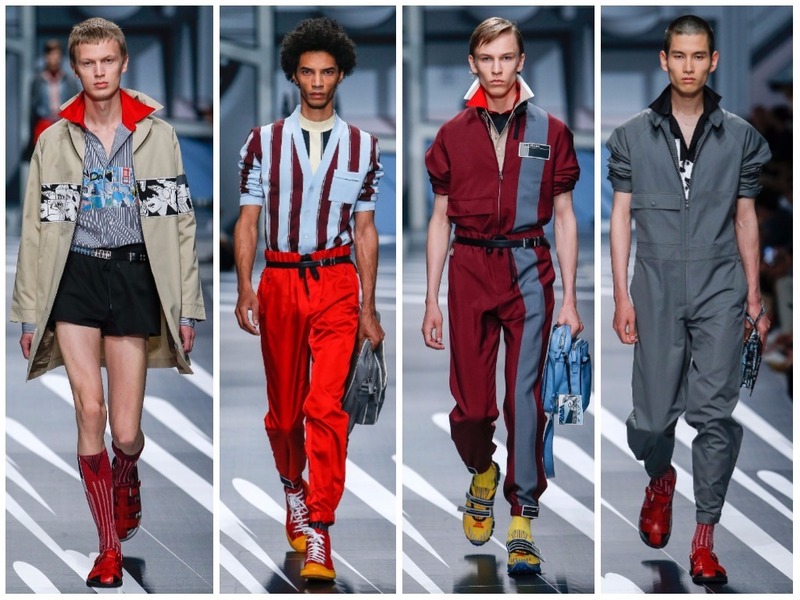 (Boiler suits and rompers wouldn’t immediately be pinned as Prada staples but their off-ness, their ability to blur gender lines are typical of the brand). 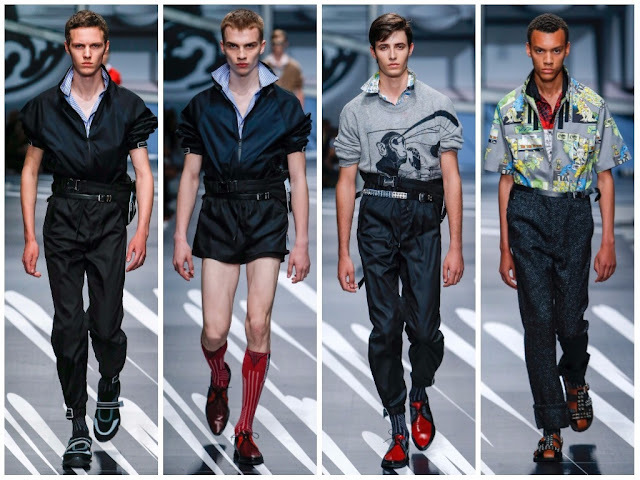 This wasn’t the best Prada menswear in recent times but it was assertive and expressively forward. It was the first Prada show that didn’t feature a smattering of womenswear—May 2017 marked the brand’s first resort show. Its exclusion from menswear pertinent, it provided for an incisive inspection of how the show could progress. The house tasked itself with an enormous, 365 day digital campaign which undoubtedly informed Mrs Prada’s focus on virtual worlds but she’s forever drawn to the quotidian. A perverse man: the Prada character is defined by his aversion to the rigid confines of society’s attitude towards gender—if he wants to wear an effeminate romper, that he shall wear—and a penchant for precision tailoring. On offer for Spring 2018 was that, a refreshingly modern melange of new wardrobe staples, muted basics, eye-catching comic book references and an attitude, reserved for someone as confidently individualistic as the Prada man, past, present, future. It exists in both virtual and real worlds.